We have decided to have a bit of fun with the alphabet and use it as a chance to give you a bit more information about our guests as well as the village of Falkland and places to go while you are here, including its’ many sites, historical features and of course places to get some fine food and drink to keep you going during your stay. A is for Allan Taylor. Allan is a fine traditional and bothy ballad singer from Alford and will be singing throughout the weekend as well as adjudicating the Bothy Ballad competition on Saturday, of which he was the winner two years ago. We are delighted to have Allan as a weekend guest and very much look forward to hearing him again. A is also for Accordion Workshop. On Saturday morning, Gary will lead the accordion workshop. Gary is a fine accordionist based in Fife. He is much in demand either as a solo performer or with his band and is a two-time all Scotland accordion champion. It will be a great opportunity to hear Gary play as well as learn from his expertise; a must for any accordion player! B is for The Bruce Inn, a 15th century coaching inn in the heart of Falkland. 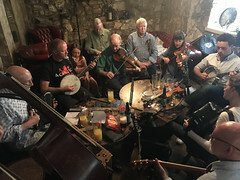 As well as providing good food and accommodation, it is also one of our best session venues in Falkland and housed superb evening sessions over the last few festivals! Every year is different but we look forward to seeing what this year will bring. C is also for The Covenanter Hotel. It is situated in the centre of Falkland and offers great food throughout the day as well as evening meals. Falkland also has Campbells Coffee House, which serves a delicious menu covering breakfast and lunch as well as home baking. No shortage of great places to eat! A bumper entry for the letter C as it is also for Competitions. The competitions are for Traditional Singing, Bothy Ballad, Fiddle, Accordion, Instrumental Pairs and Ceilidh Band/Group. 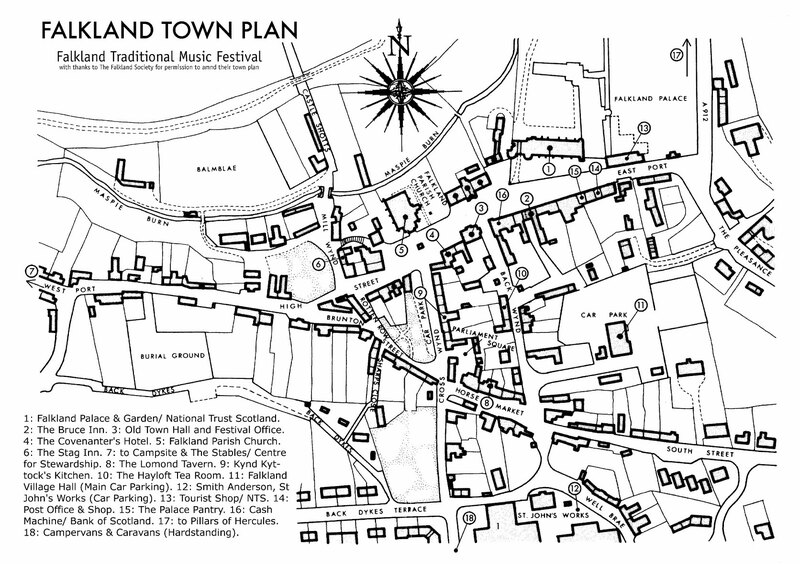 They start at 2pm; Singing competitions in the Old Town Hall, Instrumental Competitions in the Community Hall. Visit our website for more details on how to enter. Click on ‘Programme’ and then ‘Competitions’. We hope that our winners from last year are able to come back and contest their title! Competitors are also given the opportunity to perform their winning piece at the Traditional Concert on Saturday night. This is something we encourage all our winners to do as it really helps to gain confidence in performing to an audience and a very supportive and appreciative one at that. Everyone will be rooting for you! Michael Philip (fantastic accordion player and composer) once told me that being given the opportunity to perform his winning piece was what made him realise that he wanted to form his own band and the rest is history. While you may not want to set off on a musical career, competitions can help so much with building confidence and discipline as the deadline gives you a date to aim for and the individual feedback that you get afterwards is always worth the agony that you may feel beforehand! As a musician recently said, your nerves never go away, you just get better at hiding them. Please don’t see competitions as being about winning and losing but about the feedback that you will get for performing and the musical journey that it will take you on. Go for it! D is for Dancing! The festival opens with a ceilidh dance on the Friday night in the Community Hall and our band this year is The Gary Sutherland Band. Gary and his band are well known for putting on a great night and we are all looking forward to hearing them play as well as getting up for a few dances ourselves! Dust off your dancing shoes and come along for some great music. D is also for Dave Husband. Dave Husband is a renowned accordion player with his own dance band. 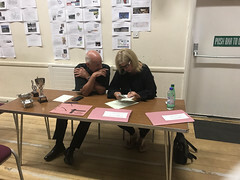 Dave will be judging the Instrumental Competitions on Saturday afternoon along with Marie Fielding and will also be a guest in the Saturday evening Traditional Concert. For us, this is what festivals are all about; hearing from experienced musicians, through their feedback in the competitions, and then a chance to hear them perform in the concerts. We look forward to welcoming Dave to our festival and to hearing him throughout the Saturday. E is for Ellen Mitchell. 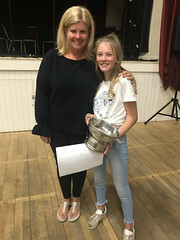 Ellen is from Glasgow and has won TMSA cups at Keith and Auchtermuchty as well as being a guest at many clubs and festivals. We are delighted to have Ellen with us as a weekend guest and also as a judge for the traditional singing competitions. E is also for East Lomond. Time now for a bit of local information. The Lomond Hills have a rich and varied history. From the Iron Age are the remains of several hill forts, which can be found around the summits of both East and West Lomond as well as at Maiden Castle, a grassy knoll that lies between the two. In more recent history, the Lomond Hills were mined for limestone, ore and lead, although there are no longer any working quarries there today. On the southwest slopes of East Lomond are the well preserved remains of a limekiln and quarry (in which the fossilised remains of prehistoric sea creatures can be found). Both East and West Lomond can easily be climbed from Craigmead Car Park, which lies between the two at a height of around 300m. Alternative routes exist from the Bunnet Stane, the village of Falkland and the car park at the masts, high on East Lomond. The views from both summits, due to their prominence, are magnificent, stretching from the Highlands to the Borders, with the sea in the east. It is well worth finding the time to walk to the top of the East Lomond, though will such an action-packed programme of events, the only question is when? We have several F’s for our list. Let’s start with Forgaitherin. Having formed in 2013, Forgaitherin are a Cupar-based, four-piece group whose aim is to provide strong vocal entertainment involving all four group members, with sympathetic instrumentation including guitar, accordion, keyboard, and whistle. Forgaitherin have already completed very successful gigs at most of the Scottish folk clubs over the past few years. Forgaitherin perform a wide-ranging mixture of both traditional and contemporary folk songs, employing chorus songs and group harmonies encouraging full audience participation. They have also now recorded two CDs; A Light in the Window and In the Red Dawn. The group comprises Lesley Toner and Hamish Grant as main vocalists, with Hugh Toner and David Toner as main instrumentalists. (David Toner will be replacing usual member, John Reid for our festival) Most of the group are also members of, and resident performers at, the Glenfarg Folk Club. Forgaitherin will be performing as part of our Sunday Farewell Concert and we look forward to hearing their mix of songs and tunes at our festival. F is also for Fiddle Masterclass. This takes place on Sunday morning in Falkland Community Hall from 10.30am – 12 noon and this year will be led by Marie Fielding. Marie Fielding is a very fine fiddle player, composer and lecturer. In this Masterclass, Marie will share tips, techniques and tunes. Participants of the Masterclass are invited to stay on and perform with Marie one of the pieces learned in the Farewell Concert. F is for Festival Office. The Festival Office is open on Saturday 11 August from 9am – 5pm. Our Festival Office is in the Community Hall, where you can buy tickets, register to enter our singing and instrumental competitions, as well as come to get any other information that you may need for your visit to our festival. F is also for Falkland Centre for Stewardship, located on the outskirts of Falkland. As well as caring for the A listed House of Falkland with its arts and craft interiors and historic landscape, the centre is now developing Falkland Estate as a place where people are learning how to live and work more sustainably. The Centre for Stewardship includes Falkland Stewardship Trust, a registered Scottish charity, Falkland Rural Enterpises Ltd that runs the home organic farm and Falkland Estate Trust. Then there is F for Fayre Earth Gift Shop which sells a beautiful selection of locally made, recycled and fairly traded products as well as delicious fair-trade coffee. G is for Gary Sutherland and his band. Gary is a fine accordionist based in Fife. He is much in demand either as a solo performer or with his band and is a two-time all Scotland accordion champion. 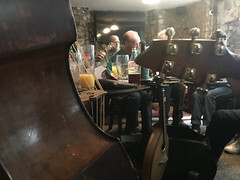 The Gary Sutherland Ceilidh Band was formed about 15 years ago and has performed all over Scotland as well as trips to the Netherlands, Uganda and Kuwait. They can be heard regularly on Radio Scotland and have released two successful CDs. Gary and his band will be in charge of the Friday ceilidh dance. On Saturday morning, Gary will lead the accordion workshop. We are delighted to have him and his band with us and it will be a great opportunity to hear Gary play as well as learn from his expertise; a must for any accordion player! H is for Hamish Moore. Hamish Moore, the renowned ‘Cauld Wind’ Piper, will be joining us for the weekend, taking part in concerts and sessions. Hamish is one of the pioneers of the re-introduction of the Scottish Small Pipes and has been a pipe maker for over 30 years. Since he started making pipes in 1986 the firm of Hamish Moore, now Hamish and Fin Moore, has made over a thousand sets of pipes. As well as making small pipes played by some of the best pipers in the world, Hamish has developed an original design for his border chanter making its sound and flavour unique. Hamish’s youngest son, Fin, is now in charge of pipe making and Hamish divides his time between some pipe making, research and development work, writing, teaching and some performances. H is for The Hayloft Tearoom, a traditional tearoom tucked away in Back Wynd but worth seeking out for delicious lunches, cakes and teas. J is for Junior entrees/visitors/participants/the future! We encourage everyone of all ages to come to our festival (and other festivals too!) and hope that there is something for everyone who is interested in traditional music and song as well as their cultural heritage or just interested in finding out more. Traditions need to be carried on by each generation we hope that our festival gives parents the opportunity to share this with their children and foster a love of traditional music and song from a young age. K is for Kevin Mitchell. Kevin is originally from Derry City in Ireland but now living in Glasgow. Kevin has won many singing competitions at Irish festivals and has a wide repertoire of songs and ballads from his home area of Derry. Kevin is a weekend guest and will judge the traditional singing competitions for us on Saturday. L is for marriage Lintels, which depict the initials of wedded couples set into stone above the doorways. They were prevalent in the 17th century, fell out of use in the 20th century but are still being preserved in the village. According to tradition, house owners had their initials carved on their homes to mark their wedding day, the day they moved in, or the date of the building. Several of them can still be found around the village so keep your eyes peeled as you walk around. L is for Library. 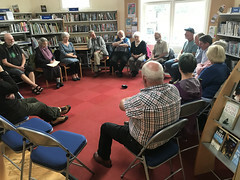 Falkland Community Trust took charge of running the local library when it was closed by Fife Council and is a very well run, volunteer-led service and information hub for the town. The library will be home to our great singing sessions on the Saturday and Sunday afternoons and supports a local volunteer-run venture. Come along and give us a song. M is for Marie Fielding. Based in Falkirk, Marie Fielding is a free-lance fiddler and composer as well as lecturer at The Royal Conservatoire of Scotland and teaches at The Tolbooth, Stirling. She has won several awards for her compositions as well as publishing two highly successful books of tunes. Marie is also an examiner for the Traditional Graded Music Exams and travels far and wide as an adjudicator. Self-taught, Marie has played, recorded and toured with most of the top Scottish dance bands over the years from the age of 17. A regular on BBC Alba, BBC Take The Floor, Travelling Folk and Radio Nan Gaidheal, Marie’s compositions have been broadcast and recorded by many musicians including Capercaillie, Tom Orr, Jim Johnston and most Scottish dance bands. Marie has produced four albums on her record label, Rumford Records, and two were nominees for best album including An Tra at the 2013 Trad Awards. Strong influences in Marie’s music come from Shetland, Tobermory, Dingle, Gaelic song, pipe music, art and her place of birth, Edinburgh. 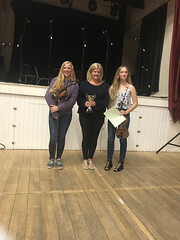 As well as being a weekend guest, Marie will also adjudicate the Instrumental Competitions on Saturday and lead the Sunday Fiddle Masterclass. We look forward to welcoming Marie to our festival. M is also for Map of Falkland, Fife​ which shows all our venues, hotels and cafes, campsite and caravan sites as well as other locations relevant to our festival weekend. Click on the link below for the link to our website. N is for Nine to Five (9am – 5pm), the Festival Office opening hours for Saturday 11 August. Our Festival Office is in the Community Hall, where you can buy tickets, register to enter our singing and instrumental competitions, as well as come to get any other information that you may need for your visit to our festival. N is also for Newton of Falkland, a small village only a mile along the road from Falkland, and home to The Malt Barn Restaurant​, which serves lunches and evening meals from Thursday to Sunday as well as high teas on Sunday from 5pm. A great excuse for a walk to work up an appetite! O is for Old Town Hall, built in 1802, with a clock tower housing a single bell, which last rang in September 1939. It is situated right in the centre of Falkland. The ground floor has housed a school, post office and a drapers shop. The National Trust for Scotland bought the Town Hall in 1986. There is an excellent local market on Saturday morning from around 9am – noon selling a great selection of bread, cakes and other goodies and local produce. Then it will be transformed into the venue for our Traditional Singing Competitions from 2pm. A fine historic setting for some of our oldest traditional songs and ballads. On an interesting historical note, Onesiphorus Tyndall (1790-1855) was born in Bristol, where his family had been merchants, slave traders and bankers, and was educated at Eton and Oxford. In 1828 he married Margaret Stuart Hamilton Bruce (1788-1869), the illegitimate daughter of Lt Col Sir Robert Hamilton Bruce by an Indian lady. Her father had died when she was 8 years old, and she was adopted by her uncle, John Hamilton Bruce, Professor of Logic at the University of Edinburgh and proprietor of Falkland. On her uncle’s death in 1826, Margaret inherited, becoming proprietor of Falkland, Nuthill and Myres, very wealthy, and Hereditary Keeper of Falkland Palace. Her uncle had disapproved of Onesiphorus because of his large debts, but when Margaret married him two years after her uncle’s death she paid off his debts and made him an allowance. Onesiphorus took her surname in addition to his own, and in 1839 they commissioned William Burn to build the new House of Falkland, replacing Nuthill House where they had lived until then. They paid for the building of the present Falkland Parish church, and Onesiphorus was commemorated by a prominent monument on the Lomond Hills, Tyndall Bruce Monument, as well as by this statue next to the church. They built The Stables near the entrance of the estate, and also the Water Fountain, which was a gift to the village from Onesipherous. The lions were added in 1865. Two feature the Tyndall Bruce coat of arms, the other two hold the Royal Burgh of Falkland crest. Both Onesiphorus and Margaret are buried in the parish kirkyard. P has several posts. The first is for Falkland Parish Church, built by Margaret and Onesiphorus Tyndall Bruce. A beautiful venue, it is home to our Saturday morning talk which this year will be by Margaret Bennett. The next P is for Pillars of Hercules, an organic farm shop and café, about a mile or a 20minute walk through the Falkland Estate from the village. The café is open from 9am – 5pm, selling vegetarian breakfasts, delicious hot and cold lunches as well as a mouth-watering selection of cakes, and of course teas, coffees or fresh juices. The shop is open from 9am – 6pm and sells their own produce as well as organic fruit and vegetables, and a wide range of foodstuffs and household products. Pillars also have camping facilities as well as a bothy which sleeps 4. Any bookings need to be made directly with Pillars of Hercules. P is also for Palace Pantry, a friendly, locally run bakers and sandwich shop, selling a tasty selection of filled rolls, homemade pies and soups, baked potatoes, paninis and toasties. They also sell a wide selection of homemade breads, rolls, savoury snacks, cakes and fancies. The Palace Pantry is open from 7am – 4pm Monday to Friday, and 8am – 3pm on Saturday. Perfect for grabbing a bite to eat between festival events! Lastly, P is for Falkland Palace, once a favourite place of Mary, Queen of Scots. Set in the heart of Falkland and surrounded by extensive gardens, this partly restored Renaissance palace is packed with 17th-century Flemish tapestries, elaborate painted ceilings and antique furnishings. The grounds are home to the oldest Real or Royal tennis court in Britain, built for King James the Fifth as well as extensive gardens and an ancient orchard with a wild flower meadow. The present custodian of the palace is Ninian Crichton-Stuart, while the National Trust for Scotland has been appointed Deputy Keeper. Q is for Mary, Queen of Scots. Mary was born in 1542 at Linlithgow Palace and succeeded her father to the throne when just six days old. Life for royalty centred around five residences; Holyrood House, Linlithgow Palace, Edinburgh Castle, Stirling Castle and Falkland Palace and Mary, Queen of Scots visited Falkland Palace every year from 1561 to 1565. She last visited Falkland in 1566. Mary, Queen of Scots is thought to have been the first woman to play golf in Scotland and it was she who adopted the French Spelling of ‘Stuart’ while living in France. R is for Royal Burgh. Falkland became a Royal Burgh in 1458 under the reign of James II (1437-1460). On 12 July 1459, there is the first mention of the Royal Palace of Falkland and it is the first time it is described as a palace instead of a castle. R is also for The Rowan Tree gift shop which is well worth a visit for unusual gift ideas. S is also for Sessions, essential to any good festival! We welcome all musicians and singers to come and join in the sessions around Falkland. The Bruce are happy for sessions all day in the front bar and through the back in the evening. The Stag are happy for daytime sessions and evening sessions from 9pm. If weather is good, we also hope to have sessions in the beer garden at the back of The Bruce. These sessions will be mixed though tend to be instrumental during the day and singing at night. Falkland Community Library will be home to our singing sessions during the day, from 2pm on Saturday and noon on Sunday. S is for singing and song. Where would tradition be without this? We love a good song and are delighted for anyone to sing one at our sessions too. T is for Tradition. Our festival aims to promote an enthusiasm for the traditional music and song of Scotland, to encourage the playing of the instrumental music and the singing of the rich store of traditional songs and ballads for which Scotland is famed throughout the world. You generally won’t see the big names at our festival, but nonetheless, our guests are some of the very best singers and musicians that you will find in Scotland, perhaps even the world! T is also for Trophies. The trophies are awarded to the prize-winners who will get to keep them for the year and then return them for the following festival. We encourage all prize-winners to come back and contest their title too! They will still be awarded the certificates as well which will be theirs to keep. 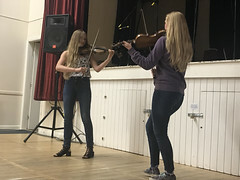 V is for Venues: Falkland Community Hall is a great hall in the middle of Falkland where we hold our concerts and ceilidh as well as our instrumental competitions and some of our workshops too. It also has disabled access. Our other venues are Falkland Parish Church, and the Old Town Hall. Session venues are The Bruce Inn, The Stag Inn and Falkland Community Library. V is also for Bob Beveridge’s Violin shop, opposite the fountain, seller and fixer of violins as well as accessories. Lastly, V is for Vintage Quine. Worth a look for beautiful clothing and accessories. W is for Workshops, of which we have two this year. The first is an Accordion workshop on Saturday morning in Falkland Community Hall from 10.30am – 12 noon. This will be led by Gary Sutherland. This workshop is open to all types of accordions and is a unique opportunity to learn from the two-time all-Scotland champion accordion player. 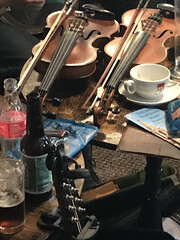 The second is a Fiddle Masterclass on Sunday morning, again in the Community Hall with our fabulous fiddle guest, Marie Fielding; a great chance to learn from one of Scotland’s finest fiddle players! The Masterclass is from 10.30am – 12 noon. There will be a fantastic opportunity (for those who would like to) to perform a piece from the Masterclass at the Farewell Concert in the afternoon. Both workshops are £5 each and are limited to 15 participants. Observers are welcome. W is also for West Lomond and Water fountain. X is for Xylophone, a highly unlikely session instrument. It is also one of the instruments that we don’t have a competition for. However, we do have competitions for Solo Fiddle, Solo Accordion, Instrumental Pair and Ceilidh Band. Visit our website to see the categories for each as well as the competition guidelines on how to enter. Good luck! Y is for Young singers and musicians, who we encourage to come to our festival, to listen to and learn from their peers, as well as enter our competitions and get an opportunity to play on stage in our concert! Y is also for Yearly festival, held on the middle weekend of August, so always an easy way to remember the dates for each year. Last but not least, Y is for You, the people who make the festival, by coming along to take part in or just listen to great music and song throughout the weekend. Thank you! Z is for Zzz and is the sleep we all need to have before the music and sessions into the early hours! I hope you have enjoyed our A-Z of our festival and Falkland, it’s been fun! Now all we need to do is get ready for the festival to begin… See you soon!